Critically-acclaimed author Yoko Tawada visited Toronto in the fall of 2018 for a special event. 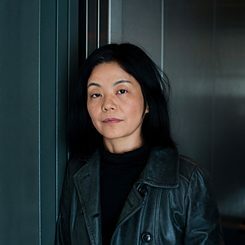 Yoko Tawada | © Heike Steinweg Critically-acclaimed author Yoko Tawada visited Toronto in the fall of 2018 for a special event. Co-presented with The Japan Foundation, Toronto, the event, “Transcending Borders: Yoko Tawada and the Fluditity of Language” saw the author in conversation with moderators Dr. Ted Goosen and Yasmin Aly discussing Tawada’s creative process, translation in literature, how meaning can change within a language and how it can be used to transcend borders. Yoko Tawada was born in Tokyo and currently resides in Berlin. She writes in Japanese and German and has won numerous literary awards. Many of her works have been translated into English and other languages. She stopped by the Goethe Institut Toronto to answer some questions about the German language. Watch her interview (in German with English subtitles). The interview was conducted by Michelle Kay, librarian and information services at the Goethe-Institut Toronto. Copyright: Text: Goethe-Institut Toronto. This work is licensed under a Creative Commons Germany Attribution – NoDerivs 3.0 Germany license.